Cascade operates Lake Tapps for eventual municipal water supply for its members, but works diligently to keep it clean and healthy today. That includes addressing milfoil and other invasive species. Milfoil is a non-regulated weed in Pierce County and Cascade has no regulatory obligations to control it in Lake Tapps. However, Cascade will continue to manage milfoil to the same level that was present when former owner Puget Sound Energy generated hydro-power. 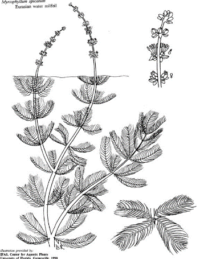 Cascade does not remove native, aquatic plant species. What is Cascade doing about milfoil? Lake Tapps reservoir is assessed annually to determine areas in greatest need of treatment. Since 2010, Cascade has managed milfoil growth in the Lake Tapps Reservoir with the following approaches. Below is a summary of Cascade’s milfoil program; click here for more detailed information. Diver Hand Pulling and Chemical Treatment: Cascade has used diver hand-pulling and chemical treatments since 2010. Click here for more information on the 2018 treatment plan and see the 2018 milfoil treatment map below. TappsWise Program: Since nutrients from lawns and septic tanks can significantly increase aquatic vegetation, Cascade has initiated the TappsWise program, a partnership with Tacoma-Pierce County Department of Health, to promote natural yard care and septic maintenance to keep Lake Tapps clean and healthy. Pilot Studies: Cascade is conducting two pilot studies in 2018 on controlling milfoil with bottom barriers and dry-land herbicide treatments. Results will be shared once they are available. Research: Cascade is working with Montana State University to sample milfoil in Lake Tapps Reservoir to identify the various strains in the reservoir and growth of these different strains over time, which would help determine the most effective herbicide. Sampling in 2017 showed eleven strains of milfoil, which will be monitored. 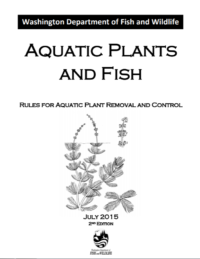 If Lake Tapps waterfront property owners plan to remove aquatic plants from in front of their property, they must follow rules outlined in Washington Department of Fish and Wildlife’s Aquatic Plants and Fish: Rules for Aquatic Plant Removal and Control. A summary is below; click here for more detailed information. Hand Removal of Aquatic Plants: Hand removal of aquatic plants can help manage growth and can be effective for small, confined areas. 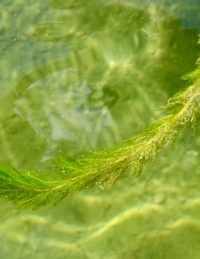 Remove the entire plant when possible – milfoil can re-grow from pieces floating in the water – and dispose it at an upland site where it cannot re-enter the water. Bottom Barriers: Bottom barriers are synthetic or natural fiber material used to cover and kill plants growing on the lake bottom. The material is anchored with sandbags or rocks. Bottom barriers are best used in small, confined areas where control of all plants is needed. For more information on bottom barriers click here and also see the Rules for Aquatic Plant Removal and Control. Reduction or Elimination of Excess Nutrients: Nutrients from lawns and septic tanks can significantly increase vegetation in the reservoir, so reducing fertilizer applications and keeping septic tanks maintained and working properly will reduce aquatic plant growth. Residents are encouraged to participate in the TappsWise program to help keep Lake Tapps clean and healthy.